One of the portions of Scripture that stood out to me while reading through the Bible in 2011 was the story of Elijah at Mt. Horeb in I Kings 19. I began to think about it over the summer, and then taught the youth from it in September, and then eventually preached from it in “big church” this past June. That entire year the story stayed with me – I turned back to it again and again for encouragement and stability, frequently finding new layers of meaning and significance in it. “What does I Kings 19 say about this?” became a frequent question from my wife; or simply, “remember Elijah.” What this story teaches about teaches about God, and the ways of God among his people, became a criterion for how I think about my life and my ministry. It really marked me. And helped me. –humbing: the one who controls the water of the entire nation (v. 1) can’t control his own (vv. 2-6). He who has power over the highest clouds in the sky has to stoop down to a brook when he is thirsty. (And eventually the brook dries up.) He has power over everyone, yet is himself completely dependent on God. I think this point is exacerbated by the fact that it is ravens (as opposed to angels, as in chapter 19) that provide for Elijah. Ravens are scavengers, ceremonially “unclean,” and rather gross looking (think of a huge crow). 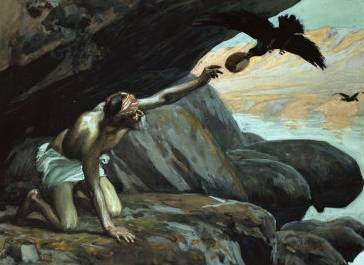 God’s provision for Elijah comes in the least grandiose and least expected way imaginable. At least bring in the food with a pack of bald eagles flying in formation, Lord! Ravens are humbling! –lonely: imagine not seeing another soul day after day after day! Even for we introverts, this sounds almost unbearable! Relationships are the meat of life. Its the relationships, not the action, that makes a TV show interesting, I think. “Its not good for man to be alone” (Genesis 2:18) – yet Elijah was alone. I can’t imagine. –boring: Elijah has nothing to do. He simply has to sit there all day, waiting for the ravens. No IPhone to play Scramble with friends on. No books. No TV. No crossword puzzles. He can’t even work for his food, or cook it. All he can do is wait. This mighty, thundering prophet, unafraid to challenge kings and nations, is forced into passivity and inaction. For a man, who is designed for work, I think this must have been one of the hardest aspects of this story. –repetitive: can you imagine eating the same food every day? Bread and meat, morning and evening, day after day. I remember in seminary, before I got married, I would eat the same food over and over sometimes, because I couldn’t cook much and couldn’t afford to go out. After a while, eating the same thing – no matter how much you like it – gets quite tedious. I can’t imagine its very healthy, either. As the months rolled by, if I were Elijah, I think I would start requesting some fruits and vegetables from the ravens. Or at least a granola bar or something. –deadening: Elijah must have felt like life had passed him by. All the “action” was elsewhere. It must have felt like moving to rural Wyoming when you’re a city person. Or posting something significant on Facebook and not getting a single “like.” It must have felt like being in the least important, least noticed place in the world. He didn’t even have a newspaper to keep up with current events. He must have felt completely passed over and insignificant. -confining: Elijah is geographically confined because he’s got to stay near that brook to drink! He could maybe walk around, but not far. I feel under-stimulated when I don’t get a change of scenery for a while. That’s why I like to visit new coffee shops and to travel. I can’t imagine how confined Elijah must have felt! He must have gotten really antsy after a couple of months. –monotonous: where I live, the summer heat lasts well into October. I remember this year the hot sun started to get to me after a while (having weak A.C. in our house probably didn’t help). You start to long for a change of weather, especially when that is what you are used to. I can’t imagine being Elijah and having to stay out in the hot sun every day, all day, in the desert, for so long! I hope he had a cave or a tree to find shade in! Even so, by the end of this ordeal he probably looked a bit like Tom Hanks at the end of Castaway – bleached hair, bushy beard, cracked skin, and a kind of wild look in his eyes. And yet in the midst of this very painful, weird season of life, God was mercifully protecting Elijah providing for Elijah, and preparing Elijah. He was protecting Elijah because Ahab had sent out spies everywhere to kill him (I Kings 18:10), and so aloneness and obscurity was the only way to be truly safe during this drought. He was providing for Elijah through the ravens and brook (and eventually the widow) – it may be been monotonous and very non-grandiose, but those ravens never missed a day. God was faithfully sustaining Elijah. It may have felt deadening, but it was not death. And most profoundly, I think, God was preparing Elijah. I have often wondered in the past while reading through I Kings 18 – the story of Elijah on Mt. Carmel – how Elijah had such strong faith that God would show up. Now I think I know (at least in part). Those months and years waiting on God, and experiencing his daily, faithful care in the midst of difficulty, must hardened Elijah’s faith and resolve like a diamond. The wilderness prepared Elijah for Carmel. The ravens prepared Elijah for victory of Baalism. That weird, mundane, painful season was exactly what Elijah needed to go through. And so it is with us. In the midst of weird, mundane, and painful seasons of life, precisely when it may feel like God has abandoned us, God is powerfully at work. He protecting, providing, and preparing. It is not a deviation from God’s purpose, it is exactly where we need to be. It is not the end of the story, but the only way the story can move forward. It is not the end of life, but the very path of life. Thank you, Lord. Sometimes I try to imagine what it would be like to be thrown into solitary confinement for faith in Jesus. We would only have God but that would be enough if our minds were steadfast on Him.